A Somali refugee at the Badbaado IDP Camp. The Badaado Camp is located in the Dharkenly District and is the largest in Mogadishu. Displaced children living within the Badbaado IDP Camp. The Badaado Camp is located in the Dharkenly District and is the largest in Mogadishu. 17 year-old Mohamed Omar awaits surgery at the Medina Hospital after being hit in the upper abdomen by a stray round. 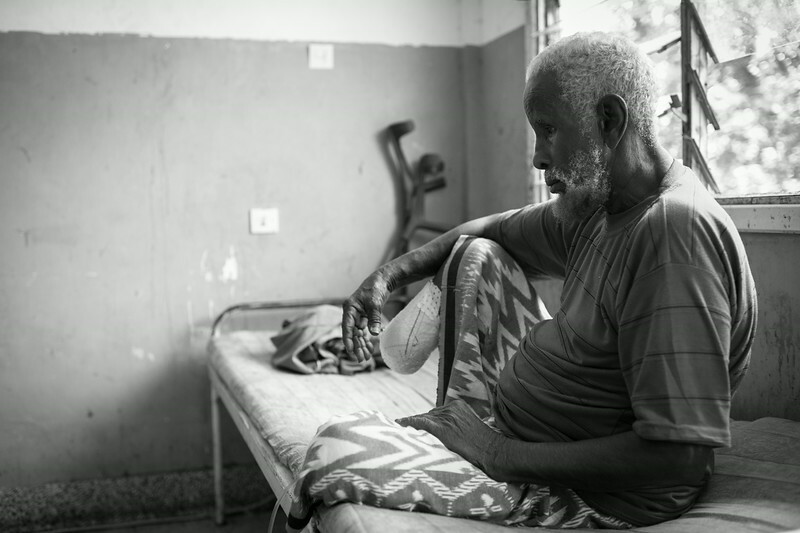 After being shot in the head during a battle between Al-Shabaab militants and AMISON troops, 61 year-old Abdulkadir Dahir lies in a coma since he was brought to the Banadir Hospital three days ago. His daughter Yasmeen is by his side. Mogadishu, Somalia. A young patient with Tuberculosis. A victim of an IED (Improvised explosive device). A ten-year-old boy lies in a coma at the Banadir Hospital in Mogadishu, Somalia. The boy was shot in the head three months prior during a battle between TFG forces and Al-Shabab militants in the capital city of Mogadishu. Orphaned children attending a class at the Mama Asha Foundation Orphanage in the Hamar Weyne district, Mogadishu, Somalia. A guard armed with an AK47 watches over the entry of the Mogadishu police station. Al-Shabaab extremists attempted to attack the facility with a car loaded with explosives a few nights prior, but the vehicle detonated before making it within the walls of the compound. TFG (Transitional Federal Government) soldiers show off a grenade captured from Al-Shabaab militants earlier in the week. Mogadishu, Somalia. Soliders of Somalia’s TFG (Transitional Federal Government) patrol the streets of the Hodan District of Mogadishu, Somalia in a"Technical". Technicals are pickup trucks that are armed with heavy or anti-aricraft machine guns. They played a vital role in the countries past and current conflicts. 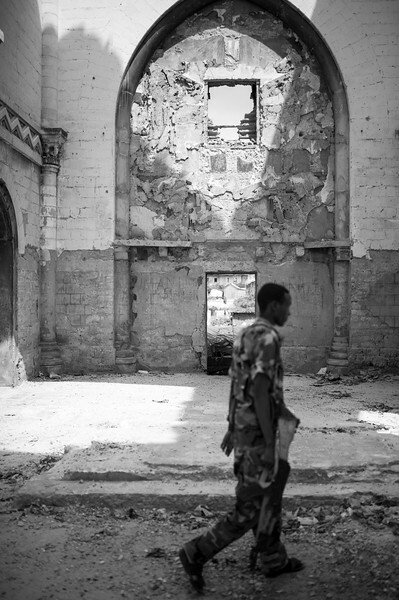 TFG soldiers patrol the Cathedral of Mogadishu. The Cathedral of Mogadishu is located in the Hamar Weyne district, which is the oldest town in Mogadishu. The cathedral was built in 1928 by Italian colonists and destroyed by Islamic fundamentalists in 2008. The Cathedral of Mogadishu is located in the Hamar Weyne district, which is the oldest town in Mogadishu. The cathedral was built in 1928 by Italian colonists and destroyed by Islamic fundamentalists in 2008. A vendor and his young apprentice at the Fish Abbatoir Market in the Hamar Weyne district, Mogadishu, Somalia. The Hamar Weyne District is the oldest town in Mogadishu. A TFG (Transitional Federal Government solider) on patrol in the Hamar Weyne district, Mogadishu, Somalia. The Hamar Weyne District is the oldest town in Mogadishu. Soldiers of Somalia’s TFG (Transitional Federal Government) outside the TFG base station in the Hodan District of Mogadishu, Somalia. Soliders of Somalia’s TFG (Transitional Federal Government) outside the TFG base station in the Hodan District of Mogadishu, Somalia. Refugees are lined in preparation for a hot meal of beans and rice provided by the Turkish Red Crescent Society. Hamar Weyne district, Mogadishu, Somalia. A young refugee on the grounds of the Cathedral of Mogadishu. The Cathedral of Mogadishu is located in the Hamar Weyne district, which is the oldest town in Mogadishu. The cathedral was built in 1928 by Italian colonists and destroyed by Islamic fundamentalists in 2008. A refugee inside of his makeshift shelter on the grounds of the Cathedral of Mogadishu. The Cathedral of Mogadishu is located in the Hamar Weyne district, which is the oldest town in Mogadishu. The cathedral was built in 1928 by Italian colonists and destroyed by Islamic fundamentalists in 2008. A 15 year-old refugee continues treatment for malnutrition at the Banadir Hospital in Mogadishu just after giving birth. Two newly registered refugees watch over their children at the Banadir Hospital in Mogadishu, Somalia. The Fish Abbatior Market in the Hamar Weyne district, Mogadishu, Somalia. The Hamar Weyne District is the oldest town in Mogadishu. An officer in charge of the jail facilities at a police station in Mogadishu, Somalia. The original induction docket of Aden Osman, who was the first prisoner of Mogadishu’s Central Prison in 1941. A detective for Mogadishu’s Central Prisons Investigation Dept holds up a crime scene photo of an Al-Shabaab militant that was killed earlier in the week as he attempted to ignite an explosive device. A prisoner accused of murder at the Central prison of Mogadishu. Criminal Investigation Departments chief detective (name withheld upon request). Central Prison of Mogadishu. A 4 year-old boy with burns covering 70% of his body awaits further treatment at the Banadir Hospital, located in the capital city of Mogadishu. Many children suffer from burn injuries as a result of cooking accidents involving heated cooking oil or scalding hot water. This 14-year-old girl was displaced from her town near Afgooye Corridor, a town 30kms from Mogadishu, Somalia. She arrived at the Maternity Ward at the Banadir Hospital in Mogadishu malnourished and dehydrated… her baby was born days after her arrival underweight and, at the time this image was taken, was being monitored for complications due to respiratory illness. Al-Shabab militants controlling areas on the outskirts of Mogadishu banned most western aid agencies from entering their territories and prevented starving villagers from fleeing famine zones. A two month old child with acute watery diarrhea awaits further treatment along with her 15 year-old mother. I came across this young boy in an IDP (Internally Displaced Persons) camp in Mogadishu, Somalia while documenting another project. Due to my affiliation with Smile Train, I was able to help facilitate his corrective surgery with the help of the head surgeon at Medina Hospital in Mogadishu. This image was taken an hour before his surgery.